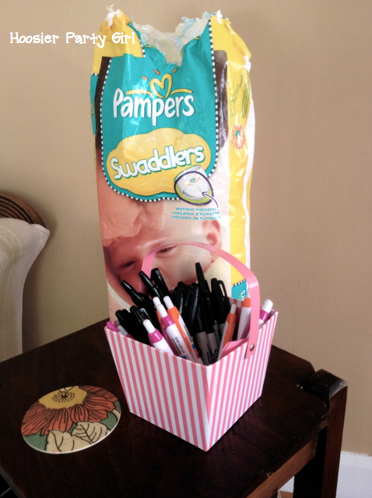 The baby shower was a group effort. It was so awesome to be able to focus on cleaning my house the day of the party rather than cleaning, then cooking, then cleaning the kitchen again! 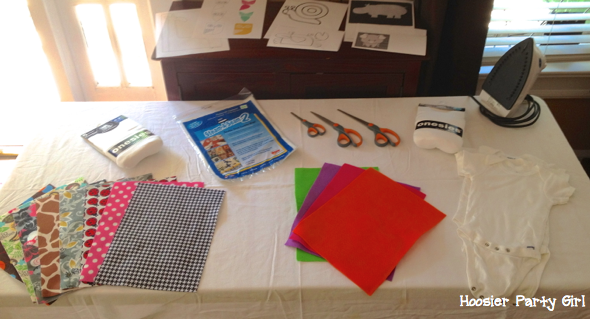 Heather was in charge of food, but she is also the source of the idea to open parties with a craft while everyone gathers. I picked up onesies, felt (it doesn’t fray), and double-sided fusing mesh (probably not what it is actually called – it was near the fabrics). I also printed out some really basic animal shapes people could copy or use as inspiration. Scissors and a couple of irons are the only other things you will need. 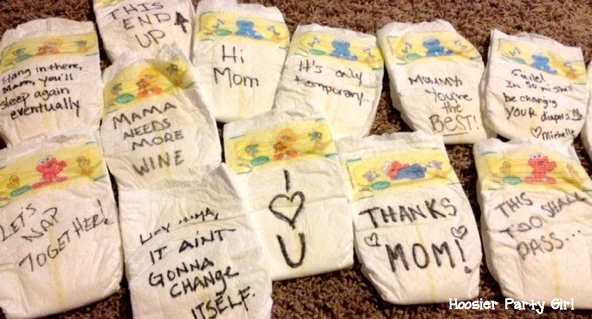 We also used the diapers left over from the diaper wreath to write funny or supportive messages to make late night diaper changes just a little less painful. I like having party wreaths for several reasons. I like making interesting wreaths, it gets people into the mood and the theme as they are walking in the door, and it helps people know that they are at the right house. I posted the picture of my diaper wreath to the evite, and more than one person said it is how they knew they were at the right place. The most difficult part of this project was finding diapers that did not have designs all over the front and the back. 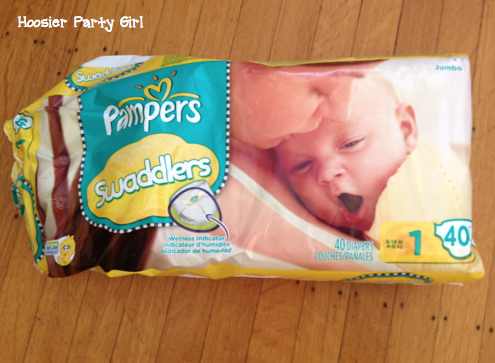 I had to check several stores and source twitter, eventually I found Pampers Swaddlers. They even smelled like baby powder! 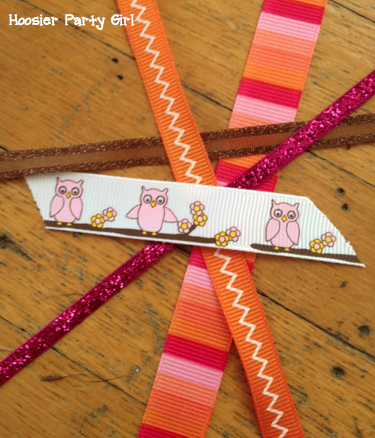 Finding the right ribbons for the theme was much easier. All of these came from the $1 bin at Michael’s. The color scheme was pink, orange, and brown with owls. I picked up a wreath at Dollar Tree (so the total cost of the wreath was $16 – the left over diapers were used for one of our shower activities). 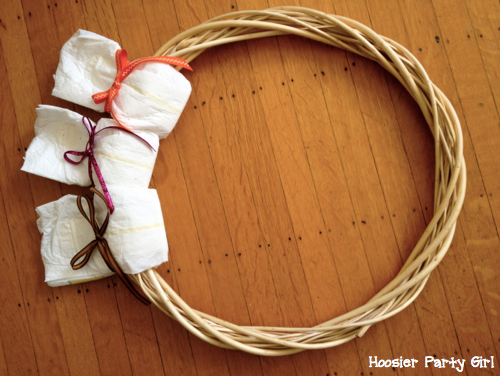 All you have to do is put the diaper over the wreath and tie the ribbon around it to get it to stay. 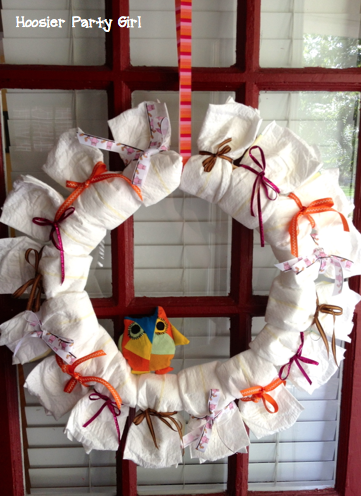 I chose the larger wreath, so with the diapers flaring around it, it was fairly large. 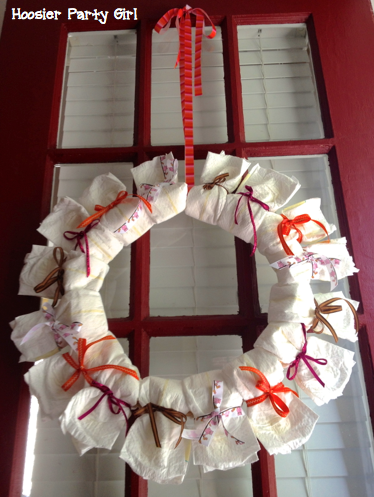 You can get away with a smaller wreath form because the diapers will make it larger. The finishing touch was an owl resting in the wreath. We had a slightly larger owl in the wreath for the party, but I didn’t snag that photo.